In Exodus 13-15 God brings a startling multi-stage miraculous deliverance of Israel from Egypt. It’s truly breathtaking, culminating in the miraculous dividing and crossing of the Red Sea, and the destruction of the powerful Egyptian army pursuing them. If ever an intervention of God would be unforgettable, this surely was it. The Israelites in the wilderness are unbearably similar to us. When their circumstances are good, they see God. But as soon as their circumstances turn bad, they forget Him and all they have to be thankful for. It’s as if present trials blot out and negate God’s past track record of faithfulness. God preserve us from such attitudes! Ingratitude is not just wrong thinking—it’s the source of endless wrong thinking. An ungrateful person not only offends God, but is also the source of his own misery, and a cancer to others, spreading his misery. Ungrateful people are not only ungrateful to God but to their families and friends and co-workers and neighbors. They’re ungrateful to their church leaders, and quick to judge and condemn everyone for falling short of their standards. Others must be blamed for the injustices they have to put up with. Everyone is at fault, including those who drive too slow or too fast, who steal that parking space they had their eye on, who grab up that sweater on sale they were looking at. Baxter is right—expressing gratitude makes a grateful heart. Children who learn to say thanks become more thankful. Gratitude is a wonderful perspective-shaping habit. Psalm 107 begins, “Give thanks to the LORD, for he is good; his love endures forever. Let the redeemed of the LORD say this.” The psalmist details the sufferings of God’s people, wandering in desert wastelands, without homes, hungry, and thirsty. “Then they cried out to the LORD in their trouble, and he delivered them from their distress” (verse 6). For their deliverance he says, “Let them give thanks to the LORD for his unfailing love and his wonderful deeds for men, for he satisfies the thirsty and fills the hungry with good things” (verses 8–9). It is God’s will that you give thanks in all circumstances (1 Thessalonians 5:18). This is something that is built into what it means to be a follower of Christ. 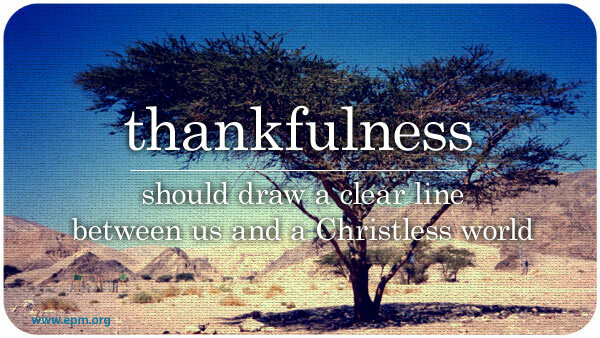 Thankfulness should draw a clear line between us and a Christless world. If the same spirit of entitlement and ingratitude that characterizes our culture characterizes us, what do we have to offer? Sometimes focusing on God’s “big miracles”—like curing cancer and making brain tumors disappear—causes us to overlook His small, daily miracles of providence in which He holds the universe together, keeps our hearts beating, provides us with air to breathe and lungs to breathe it, and gives us food to eat and stomachs to digest it. Our thankfulness glorifies God and makes Him happy: “The one who offers thanksgiving as his sacrifice glorifies me” (Psalm 50:23). But God isn’t the only one affected when we give thanks. I’ve mentioned before my appreciation for Ann Voskamp’s One Thousand Gifts. This passage from her book was one of many that stuck out to me.